Editor's note: I published the investing thesis on Fonar on Jan. 13, 2014. With a small float, this small-cap firm has experienced substantial swing in share price. Nonetheless, it has continued to generate increasing earnings for shareholders. It is worthwhile to consider increasing position in Fonar. As a young medical doctor, my inquisitive nature led me to discover Fonar (NASDAQ:FONR) Corporation in late 2011 when I was having a conversation with a cardiology colleague at my former place of training. Fonar is a small Delaware incorporated company, headquartered in Melville, New York that engages in the business of "designing, manufacturing, selling, and servicing the magnetic resonance imaging ("MRI") scanners." In this research report, I am going to feature Fonar through the lenses of "Integrated Investing" approach designed for the activist retail investors. Fonar is a turnaround company that have overcome a troubled past and emerged as an aggressive growth story. With his genius and innovative mind, Raymond Damadian, M.D., President and Chairman, positioned Fonar to become a profitable growth company having posted 15 consecutive quarters of increased earnings. On November 15th, 2013, Fonar reported its revenue of $16 million and net income of $3.6 million during first quarter of fiscal year 2014. This represents 77% and 104% increase in year-to-year revenue and net income, respectively. FONR share price responded by increasing more than 60% in one day and it has increased to around 200% for the past three months. Despite these recent increases in price per share ("PPS"), I believe that Fonar, currently being on sale for $165 million but worth at least $219 million, is undervalued by roughly 33%. This striking mismatch in an enterprise's intrinsic value versus its market value would pose Fonar as an attractive investment, one that would produce superior returns for the intelligent and patience retail investors. Accordingly, shares price for Fonar is likely to continue its increasing trend in the long term, which could yield multi-baggers for its investors. The science behind MRI technology relates to "electromagnetic properties" of the single positively charged proton of the Hydrogen atom. Protons are found in human tissues and the MRI scanner is able to tweak these properties to produce beautiful images that can differentiate disease/cancerous tissues from normal tissues. Protons in our body have a "magnetic vector" or a "line of force" that points in random directions in its natural state. When a patient enters an MRI scanner that produces a magnetic field, these protons re-align themselves in parallel to the magnetic field of the MRI accordingly. The MRI machine, then, sends pulses of harmless radiofrequency waves, at certain angles, pushing these proton's lines of force (180 degrees) into an "unnatural" state. When the MRI scanner stops the pulse of radiofrequency waves, these protons move back to their natural orientation, thereby releasing their energy signals in the process. Different tissues in the human body emit different amount energy or photon, which translate into signals of different strengths/colors. These colors are mapped into beautiful images allowing doctors to distinguish diseased from normal human tissues. The imaging of soft tissues produced by the MRI is much more detailed than other imaging modalities such as Ultrasounds ("US"), X-rays ("XR") or Computed Tomography ("CT") scans. Due to the enhanced and detailed images produced by the MRI scanner on a broad range of tissues, the MRI scanner serves as a better diagnostic tool over other modality. For instance, MRI would be best for detecting soft tissues and bone cancers. Moreover, MRI detects bleeds better than CT. Nevertheless, it is important to note that the cost associated with any medical imaging is important to doctors. Therefore, physicians would order less accurate but more cost-efficient diagnostic modality initially. Accordingly, a CT scan would be ordered before an MRI scan would be ordered in detecting brain bleeds. When putting these factors into perspective, it is evident that MRI is a medical diagnostic technology that is intrinsically weaved into the fabric of medicine. Hence, it is unlikely that the roles of MRI scanners in medicine will decrease over time. On the contrary, the roles of MRI scanners will increase in the future as they become more affordable. Further, it is important to be cognizant that not all MRI technology is created equal. So the million dollars question is … which MRI technology is the best? In my opinion, the revolutionary Upright® Multi-Positional ("Upright") MRI designed by Doctor Damadian, the genius inventor and physician executive, is the best MRI technology known-to-man. In my previous article, I covered another revolutionary technology (Afrezza) being developed by MANNKIND CORPORATION (MNKD) for diabetes mellitus treatment I demonstrated that obesity is a high prevalence condition plaguing the Western World. Obesity contributes to many co-morbidities including hypertension, hyperlipidemia, and insulin resistance (which lead to Diabetes Mellitus Type 2). Not only does obesity induces the body to become vulnerable to diseases, it also poses plethora of challenges for doctors to perform various physically exams and diagnostic imaging. Fonar proprietary Upright MRI is "able to truly accommodate overweight and obese patients," thus supporting its increasing utility. Consequently, the increase in MRI usage would translate into Fonar's increasing revenues and earnings. In stark contrast to the Upright MRI, its competitors, the conventional recumbent MRI scanners are not ale to scan most obese patients due to these patients' size as the limiting factor. While some people may argue that MRI companies like General Electric and Siemen tried to accommodate larger patients with the development of their "open MRIs". However, these conventional MRI scanners are not in the same league as FONR's revolutionary Upright MRI when all factors are considered. Static MRI "miss rate" at the critical L4-5 segment is 35.1%. Static MRI "Miss Rate" at L3-4 is even higher at 38.7%. Static MRI Overall "miss rate" is 18.1%. Spinal stenosis measured in flexion and extension with high precision potential for greater precision in optimization decompression. Consider the image below. 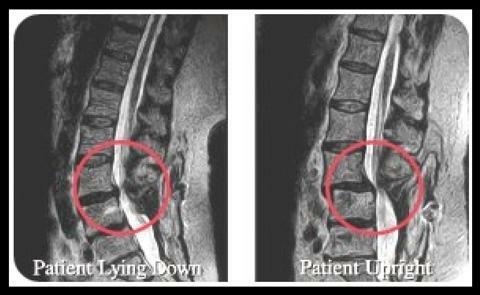 This image demonstrated a case in which the etiology of low back pain was missed using the conventional/recumbent MRI but it was detected using the Upright MRI scanner. Radiation exposure in medical diagnostics has accumulative effect in increasing the patient's risk of developing cancer later in life. Research by The National Cancer Institute showed that there are significantly increased risks of developing breast cancer among women who had scoliosis as children and were X-ray scanned multiple times a year. The risks increased with the number of time scanned, as well as, the length-of-time since being scanned. The Upright MRI is the world's first radiation-free scoliosis screening technology that helps reduces the increased risks associated with radiation-induced breast cancers. As it is true with any form of technology, for example Mannkind Corporation's Afrezza, users' friendliness is an important deciding factor in the market acceptance and sales of a device. Similar to Mannkind Corporation's Proprietary Technosphere Insulin, Afrezza, Fonar Corporation's Upright MRI is quite user friendly per se. Through the application of the Upright MRI, a child could sit on his/her mother's lap while being radiation­free scanned to help physicians better diagnose cancerous tumors or pathology in general. By removing the frustrating factors like when an infant cries and not cooperates with doctors like what could happen when using the conventional MRI, the Upright MRI positioned itself to be favored by doctors and hospitals ... with their practice having overworked and fatigued physicians as well as ancillary staffs. On the contrary, when a technology that failed to take into consideration this "convenience factor" is likely to fail in its utility. For instance, the "bong­like" device, Exubera, manufactured by Pfizer failed to take into consideration this user friendliness factor into its design, indeed, suffered dismal sales recognition. Consequently, Exubera was taken off the market sometime later because it failed to generate profits for Pfizer. Many patients in the hospital settings detest the recumbent MRI machines for it tends to cause patients to feel claustrophobic. With the Upright MRI, claustrophobia is no longer a concern. 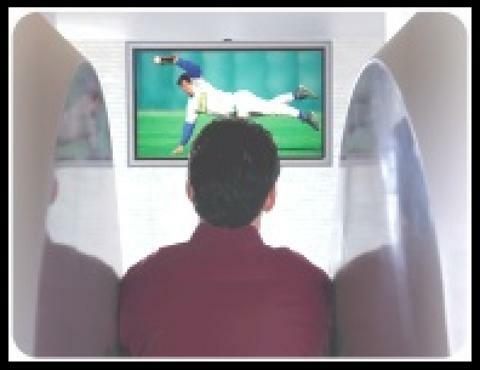 A patient could comfortably sits in an Upright MRI scanner, enjoying a movie flick while the scanning is performed. The Upright MRI scanner is able to detect sports related injury better than conventional MRI scanners, thus increasing its applications in sports medicine. Sport medicine physicians rely heavily on diagnostic imaging. Given this fact, sport medicine doctors would prefer the Upright MRI scanners to its competitors, thus contributing to Fonar's increasing moat in medical diagnostics. Consider the story of how the Upright MRI is able to pinpoint the pathology to help Dr. R. in treating the postconcussion syndrome suffered by the NFL quarterback Jim McMahon … in his own words and those of his seven years girlfriend, Laurie Navon. "I had a guy in New York that figured out I had vertebrae that was cutting off my spinal fluid. It was all backing up into my brain," he said in an interview a few days ago while in town to play in a fundraising golf tournament to improve athletic facilities at Roy High School, his alma mater. "Once they adjusted those two vertebrae and all that stuff came out, I haven't had any headaches." "I've seen huge improvement in him ... I looked at Jim and he looked at me, and all of a sudden, crazy as it may sound, he had color his face, his eyes looked clearer and Dr. Raymond Damadian said he could tell an immediate difference in his speech. Mac said he felt like a toilet bowl had been flushed in his head and everything came out." "It's definitely made a huge difference," she said. "He's not so ornery. His mood swings were crazy; he was high and he was low. ... We went back and Dr. Damadian did the same exact scans again and he thinks all that fluid that was in his brain is now flowing up and back, up and back the way it should in all of us." Multiple sclerosis ("MS") is a deadly medical condition that has doctors scratching on heads. The etiology of this condition remains unclear. However, the breakthrough research finding on MS by Dr. Damadian and his colleague, shed lights to a new paradigm in the MS medical community. Consequently, this breakthrough has been attracting greater interest in this overlooked yet revolutionary technology. Moreover, this evidence shown that not only the Upright MRI could be use as a diagnostic technology but also one that could be utilize for research as well. MELVILLE, NEW YORK, October 5, 2011 ­ In a newly published paper, medical researchers at FONAR Corporation report a diagnostic breakthrough in multiple sclerosis, based on observations made possible by the company's unique Upright MRI. The findings reveal that the cause of multiple sclerosis may be biomechanical and related to earlier trauma to the neck, which can result in obstruction of the flow of cerebrospinal fluid ("CSF"), which is produced and stored in the central anatomic structures of the brain known as the ventricles. Since the ventricles produce a large volume of CSF each day (500 cc), the obstruction can result in a build up of pressure within the ventricles, resulting in leakage of the CSF into the surrounding brain tissue. This leakage could be responsible for generating the brain lesions of multiple sclerosis. Commenting on the study, the lead researcher and president of Fonar, Raymond V. Damadian stated, "These new observations have uncovered biomechanical barriers that appear to give rise to multiple sclerosis, and, even more excitingly, these barriers may be therapeutically addressable." Damadian is the medical doctor who discovered the abnormal signals from tissue that are the basis of every MRI image made today and who went on to invent the MRI and builds the world's first MRI by hand at New York's Downstate Medical Center. The findings are based on viewing the real­time flow of cerebrospinal fluid in a series of eight randomly chosen patients with multiple sclerosis. The cerebrospinal fluid, known as CSF, lubricates the brain and spinal cord. Utilizing Fonar's patented advanced Upright MRI technology, the team was able to view the flow of cerebrospinal fluid in and out of the brain with the patients lying down and upright. These invaluable dual observations have only been possible since the invention by Fonar of an MRI capable of imaging the patient upright. While one could argue that this is a small study, thus reducing the important of this finding. However, I believe that this study opened a new lead … one that could yield important discoveries in the foreseeable future. This discovery and the potential discoveries in the future could only strength the moat surrounding Fonar. 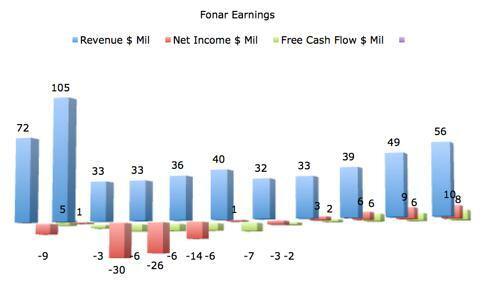 As demonstrated in the graph and table below, Fonar is scanning an increasing trend in revenue, net income, and free cash flow. The revenue for the trailing twelve months ("TTM") was $56 million. During this same time, the company also recognized a net income of $10million. In my opinion, investing in a company that has successfully turned around and increasing its earnings would yield much better results than investing in "hopeful" turnaround stories … most turnaround companies that have not been able to generate increasing earnings tend to relapsed into failure. Fonar's earnings per share ("EPS") were $1.49; the company has a price per earnings ("PE") of 17. The stock's price per share ("PPS") is about $25 as of January 8th, 2014. For a growth biotechnology/healthcare stock, I would argue that the PE should be much higher than the current value of 17. For instance, Siemen and General Electrics have PE around 20 while DaVita Healthcare has a PE of 26. Similarly, USMD Holdings have a PE of 146. Hence, I used a conservative figure in this research and assigned a PE of 25 to Fonar. Using a PE of 25 to multiply by Fonar EPS of $1.49, I arrived at a PPS of $35 for the company. To calculate how much of a bargain Fonar is being on sale, I divided $25 by $35 to arrive at the figure of roughly 67%. By subtracting 67% from 100%, I found that Fonar is currently being on sale for 33% discount below its true value. While some may argue that the third quarter earnings report showed a declined income from equipment sales. As I argued in my other paper featuring Fonar, I believe larger competitors have greater financial resources, thus they are able to offer better financing terms for buyers. This helps explain the irony why larger companies like Siemen or General Electrics are able to sell more MRI scanners than Fonar ... despite the fact that their MRI are inferior to those MRI designed by Dr. Damadian. Nevertheless, as Fonar continues to grow, the company will be able to offer better financing terms. This, in turns, would generate the MRI sales "kicker" for FONAR. Even if Fonar would be unable to generate increasing sales for its MRI scanners in the future, it would still be quite profitable running its diagnostic division alone. As I demonstrated earlier, Fonar is powered by the Upright MRI … a revolutionary technology having many competitive edges over its competitor, ironically, the company is facing declining sales in their MRI scanners. However, the key driver that has been powering the turnaround and growth of Fonar is its diagnostic management business. Medical diagnostic is a highly profitable division in medicine. Radiologists, physicians whose work involved the use of diagnostic devices to diagnose and treat medical conditions, tend to earn significantly greater income than other doctors … for instance, a primary care doctor like me. In similar fashion, diagnostic centers tend to generate greater revenue and income than primary physician offices. By managing and running these diagnostic centers, Fonar also able to capture the good profit margin in this diagnostic division. Fonar Corporation, founded in 1978, headquartered in Melville, New York. The company operates two business segments including (1) manufacturing and selling of the Upright Multi-Position MRI scanners and (2) managing physician practice diagnostic centers. Fonar's subsidiary, Health Management Corporation of America (HMCA), conducts Fonar's practice management business through Imperial Management Services, LLC. 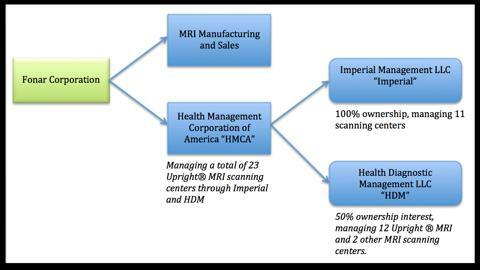 On March 6th, 2013, HMCA acquired a 50% controlling interest in Health Diagnostic Management, LLC ("HDM"). This strategic expansion increased the Upright MRI center under HMCA's management up to a total of 23 centers. Any discussion about Fonar Corporation's or any corporation without examining the company's executive would be incomplete. Accordingly, Fonar is powered by Raymond Damadian, MD, President and Chairman. Doctor Damadian is distinguished from other executives for the fact that his talents are multi­dimensional, which is analogous to the "jack of all trades and master of all" Leonardo From Vinci. Like Da Vinci, Dr. Damadian is more than a physician for he is also an executive, and an inventor of the MRI ... a technology that saves millions of lives. Raymond Damadian, MD, founded Fonar in 1978. This company is the oldest and most experienced MRI manufacturer in the world. Dr. Damadian discovered that the different relaxation time (the "energy emission signature") of the proton, which formed the science behind all MRI technology. The Doctor filed for his pioneer patent in 1972. With the help of his post-graduated assistants, Dr. Lawrence Minkoff and Michael Goldsmith, Damadian built the first human MRI scanner, which he named, "Indomitable" in 1977. Fonar went public a year after it produced the first commercial MRI in 1981. Fonar is a small cap growth medical diagnostic management/MRI sales company that entered its aggressive growth phase by successfully duplicated its growth formula. According to Peter Lynch, this is a good phase to invest in such a growth company, because it minimizes the risks associated with the start­up growth phase. Increasing trend in its use as the technology become more affordable. This is true of all technology in term of its pricing. According to the Father of growth investing, Phillip Fisher, research allows technology to be manufactured with increasing efficiency, thus decreasing its cost. For example, most laptops in the past three years were much more expensive than its price today. Fonar Corporation is on sale at a discount of more than 33%, thus it has plenty of room to grow. At the current PPS, purchasing Fonar is similar to paying less than 70 cents for the Dollar. The company increasing earnings trend is mostly from its diagnostic management division of the Upright MRI centers with net earnings doubled due to its recent acquisition of HDM. This trend is likely to continue suggesting many more years of growth in this business segment. Fonar's two business divisions, MRI sales and MRI center management, are supported by strong industry fundamentals and the Upright MRI is superior to other diagnostic competitors. The Upright MRI sales have been plateauing during recent years. However, the recent breakthrough research publications on MS and many other factors are strengthening its moat ... like the story how the Upright MRI is helping doctor R. to treat the postconcussion syndrome suffered by NFL QB Star, Tim McMahon, ... could help revive this business segment of the company, as well as, strengthening its diagnostic segment. Regardless whether sales of the Upright MRI improve, Fonar's diagnostic management division (HMCA subsidiary) is the key driver for Growth, and the fundamental analysis suggests that this segment is has been and would continue to improve. 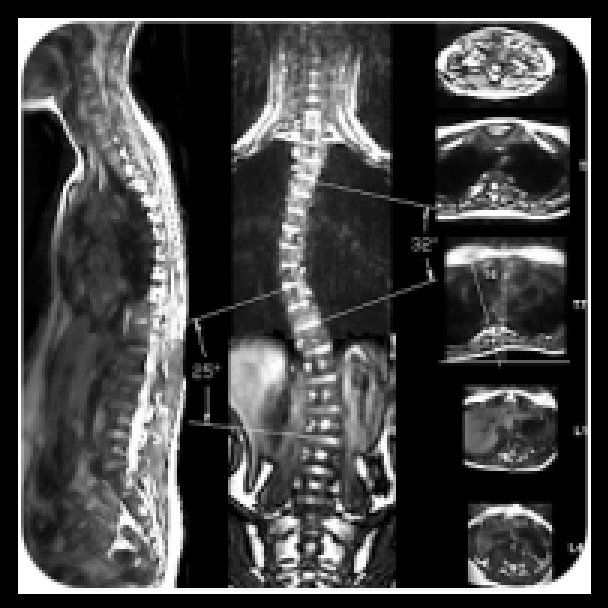 The intrinsic properties of the Upright MRI and its interconnectedness in medicine offer the Upright MRI a strong competitive moat. The company is powered by the genius mind of Doctor Damadian, the inventor of the MRI. Dr. Damadian has been the company's CEO and Founder since its inception. Moreover, he has demonstrated a deep commitment to see Fonar succeed. In viewing Fonar through the lenses of an investor, I strongly believe that as long as Fonar focuses its resources on growing/expanding its diagnostic management portfolio, the company will continue to increase its growing profits in the future. On the contrary when viewing Fonar through the lenses of a medical doctor, I strongly encourage Fonar to further strengthen its moat by maintaining research and continuing to produce new breakthrough discoveries ... some of which could solve medical quandaries like multiple sclerosis per se. The bottom line for Fonar is that despite recent sharp increase in share price, this growth company is still undervalued by roughly 33%. This striking mismatch in an enterprise's intrinsic value versus its market value makes Fonar an attractive investment. Share price of this overlooked company is likely to continue its increasing trend in rewarding loyal shareholders. If you decide to invest in Fonar, I would follow the growth of its diagnostic division. Further, I would track to see how the Upright MRI fares against the new 3.0Tesla competitor.